I arrived in Lake Superior in mid-July, considered to be the optimum time to cruise the lake. I was excited to be there having wondered what it would be really like. 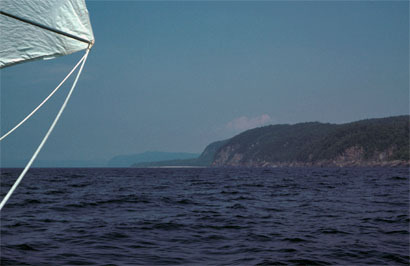 There is not much information about people cruising Lake Superior in small sailboats. My first day was anti-climatic, the weather was warm with little wind as shown in the photo. I really didn't mind though - I was glad to get any nice weather I could. I sheepishly took off my safety harness, ski jacket, ski gloves, shook out the reef, put up the #1 and had an easy sail in light winds to my first destination - a beautiful, though somewhat exposed bay so I was glad of the good weather. The first night was very quiet and peaceful - I figured out there was probably nobody within 30 miles of where I was anchored alone in a long thin bay. First time in my life that would have been the case!